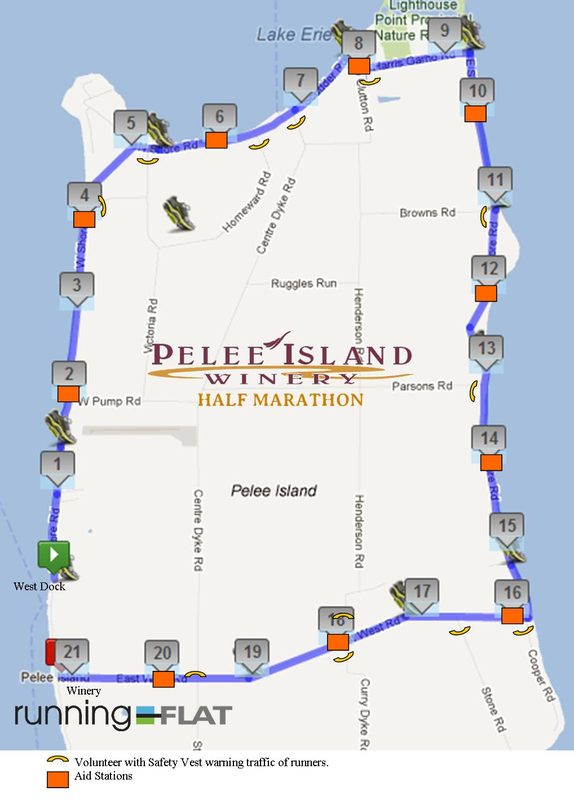 Welcome to the third annual Pelee Island Winery Half Marathon. 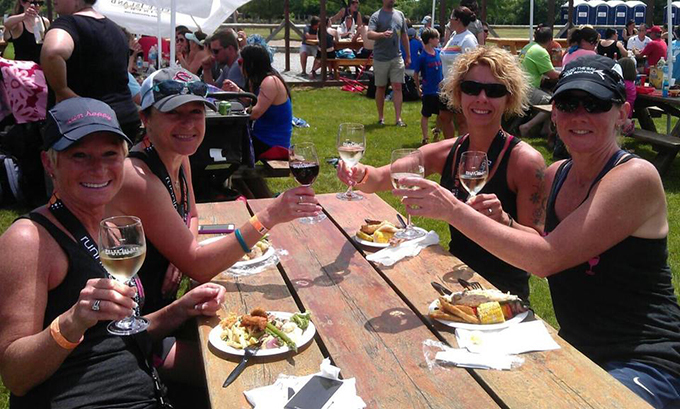 Canada’s most Southern Half-Marathon takesplace on a remote Lake Erie Island,ending in a Winery. 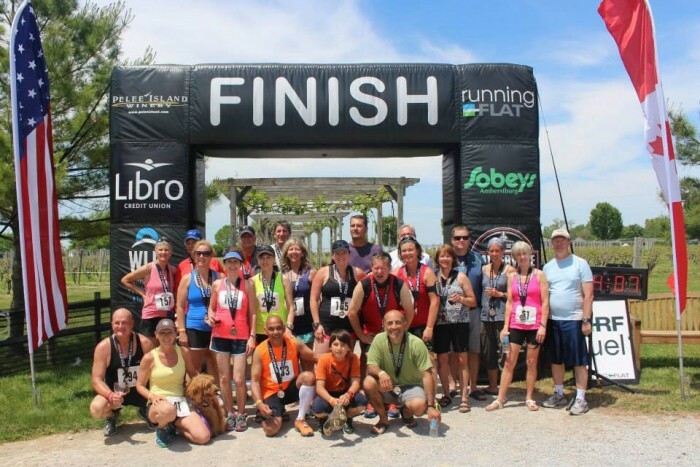 This exclusive event is limited to only 350 participants, who will enjoy the beauty of running around this pristine island, with Aid Stations every 2K with a Port-a-John. The course is measured and certified, as well as timed, surfaced with a mixture of pavement, gravel, and tar and chip. 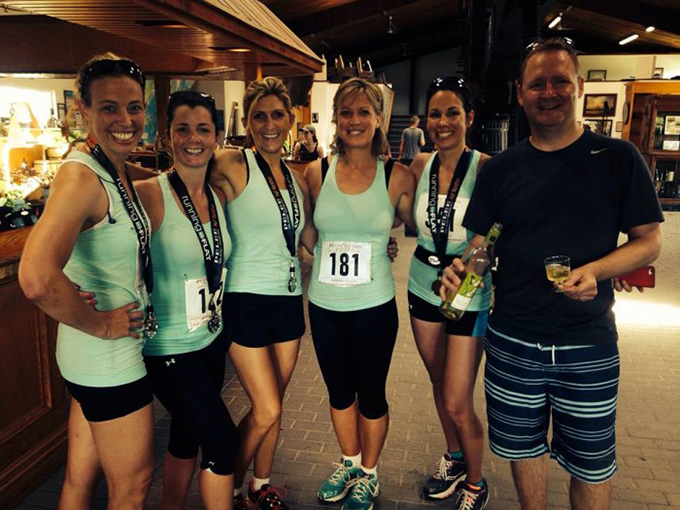 Registration includes a great Wine-inspired Tech Shirt, award winning medal, bib and a ticket to the After-Run Party and Wine Tasting. For more picture and feedback about the event go to our Facebook page. 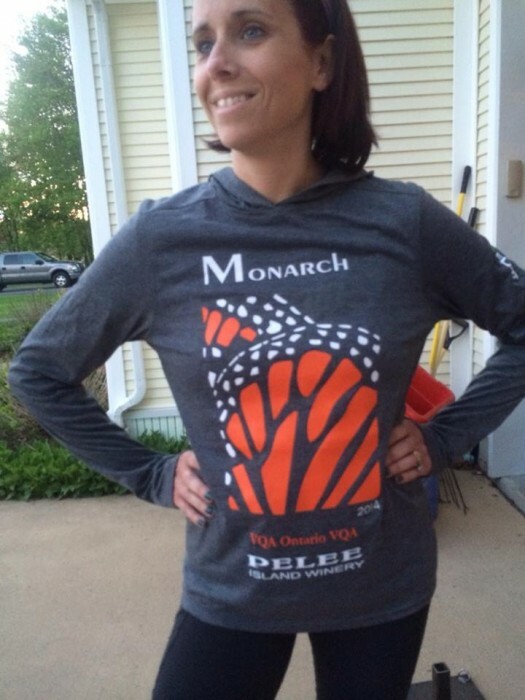 These are 2014 shirt and medal pictured below honouring the Monarch Butterfly. 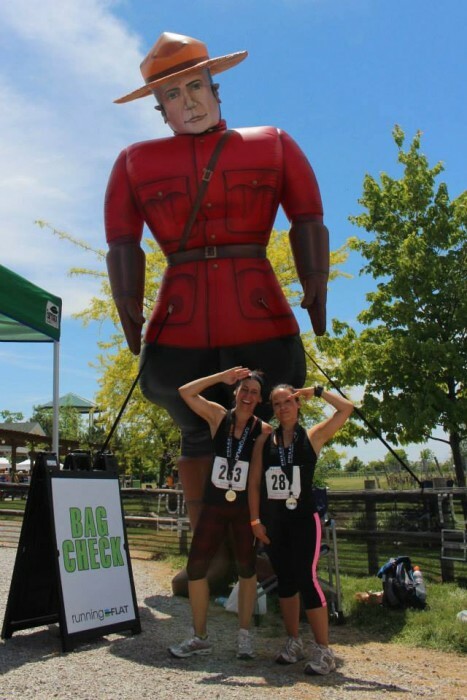 Bring your sweetheart, friends and family, to stay the night and enjoy the run in the morning (you'll have to stay the night because the ferry doesn't cross early enough that day to get the Island in time for the run!) The night before there will be plenty of dinners and parties going on around the Island, of which you will be notified. You can also buy extra tickets for your guests to join you at the Winery for an extravagant luncheon starting at noon. Adults are $35 and kids under 11 years of age are $20 each. THIS IS VERY LIMITED SO BUY IT NOW DO NOT WAIT IT SELLS OUT. RunningFlat has a NO REFUND policy. As you exit the West Dock Terminal upon arriving on the island you will see the RunningFlat Tent and flags accross the parking lot infront of the WESTVIEW RESTAURANT. If there is inclement weather we will be inside of the WESTVIEW RESTAURANT directly accross from the dock terminal. We are there all day Saturday from 10:00am to 8:00pm to greet the first boat to the last boat arriving on the island. TICKETS MUST HAVE BEEN PURCHASED AHEAD OF TIME TO ATTEND THE LUNCHEON. EACH RUNNER HAS A TICKET TO THIS LUNCHEON INCLUDED IN THEIR REGISTRATION. THERE ARE A LIMITED AMOUNT OF TICKETS TO THE LUNCHEON AVAILABLE. Welcome to Pelee Island, Canada's most southern inhabited Community. Here is a quick overview to get you familiarized with Pelee Island. I always say, "Pelee Island is no Vegas!" Pelee has all the basic necessities... if you're looking for extravagant things, this is not the place! The island is 34 km around the perimeter. Over half of the Island is farmed, while 20% of the island has been set aside for conservation. There are lots of beaches and forests, and waterfront cottages. The population fluctuates seasonally. The community has a Co-Op (519)724-2910 which serves as Post Office, Grocery Store, Gas Station & Hardware Store, and is open most days 9am-2pm. There is NO ATM Machine on the island. Most establishments accept major credit cards or debit, and the LCBO offers cash back with purchase. The roads on Pelee are narrow, and some are gravel. Please allow enough room for bicycles and vehicles traveling in the opposite direction. Pelee has a variety of Bed and Breakfasts around the island, ranging from quaint and homey to higher end Bed & Breakfasts. For a list of other accommodations visit the web at www.pelee.org click “enter” then, “accommodations”. Pelee Island has 25-30 Cottage Rentals, book your cottage for your group and enjoy the comforts of your own space. Please see Explore Pelee.com and check out Accommodations. Traveling to Pelee Island you'll have to take the ferry from the Leamington Terminal. Each sailing is 1.5 hours and passengers with vehicles are required to be at ferry terminal 1 hour prior to sailing. If bringing your vehicle you may call 1-800-661-2220 in advance to reserve your vehicle March 1st, 2015. Reservations are not required for walk-on passengers. If you do not have a vehicle, there is a taxi service Explore Pelee (519)325-8687 that can drive you to and from your destinations once on Pelee Island. There is a ferry service that we suggest you call and get your vehicle reservation before you book your lodging. 1-800-661-2220. If you do not have a vehicle, there is a taxi service Explore Pelee(519)325-8687 that can drive you to and from your destinations once on Pelee Island. There is also an international airport on Pelee to land your private plane. Pelee Island International Airport Please contact them to make arrangements for your arrival. Comfortech Bicycle Shop by West Dock. Bike Rental Costs $20/day/bike or $8/hour/bike. For other bike rental inquiries please contact (519) 724-2828. Pelee Island Heritage Centre- a local museum with human and natural history on the island. Costs $3/person for entrance fees. Also new last year, a Kite Museum inside the Heritage Centre. 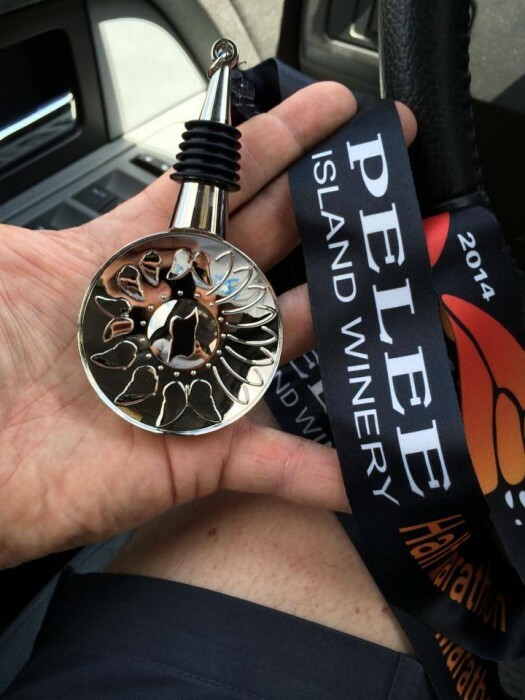 Pelee Island Winery- offers wine tours and wine tastings. Tours start at 12, 2, 4 & 6pm. (519)724-2469 for tour times, as they may vary depending on boat schedule. Pelee Island Bird Observatory- offers guided bird walks during birding season at Fish Point Nature Reserve. As well as, environmental field trips and cottage rental. (519) 724-2829. Pelee Island Art Works- Pelee has some art shops and a clothing store, as well as places to buy souvenirs. Down the Lane Clothing Boutique- Women's clothing store and ice cream shop beside. Located close to west dock, great for summer wear, jewelry and gifts. Hope this information gets you started and gives you an idea of what Pelee Island has to offer. Let us know if you have any further questions.